I think a new outfit for the first day of school is a necessity. I got one (or two!) every year growing up, and I found it helped me to leave summer behind and get excited about the new school year. Now that I carry on the tradition with my own children I'm always interested to see how their style changes from year to year. While my little girl once adored frilly dresses and a wild mix of colours and patterns, she now favours a more simple and sporty style. She is beginning competitive dance this year, so she is a fan of dance-related clothing such as track pants and hoodies. She also still likes fashion with a touch of whimsy, like the heart-themed tops and leggings from Sears, above. My son's sense of style hasn't changed as dramatically as his sister's. He continues to favour jeans, plaid shirts, camouflage and sports-related clothing. He has been playing competitive soccer and basketball for a few years now, so sporty fashions have become more dominant than they used to be. He still likes skateboarding fashions too, so the Tony Hawk line at Sears works well for him. 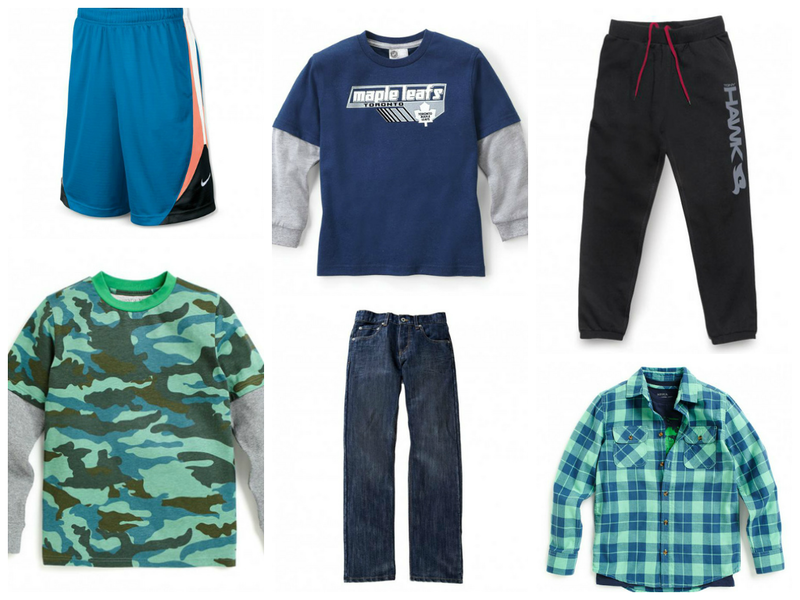 Sears carries a variety of top quality brands to suit both of my kids. Because price is always a factor, I regularly peruse the Sears flyers and catalogues to get great deals. This year, throughout the month of August, Sears Canada (The Kids Room) will be, and has been, helping families with school-aged children get ready for back-to-school. Across Canada, Sears has been surprising shoppers by providing their purchases to them for free. Watch this cute video to see the happy faces of some lucky shoppers. Sears Canada will be rewarding their Facebook fans too, by surprising them throughout the month with opportunities to win a $100 Sears gift card. For over 40 years, Sears Canada has been a proud supporter of Boys and Girls Clubs of Canada (BGCC), the country's leading provider of quality after-school programs supporting the healthy physical, educational, social and mental development of children and youth. To help with this year’s back-to-school season, Sears Canada and Converse are providing BGCC with $10,000 worth of apparel! What is your back-to-school tradition? Sears has generously offered to give one lucky Woman in Real Life reader a $100 gift card. Must be 18 or over and a resident of Canada (excluding QC). The winner should expect to receive the prize 4-6 weeks after the contest closes. You may enter to win across multiple blogs, but can only win on one blog. Enter using the rafflecopter below until August 27th. Buying one new pair of shoes. My favorite back to school tradition is taking our kids to the Ex on the Friday before Labour Day. As a child, my favourite back to school tradition was going shopping for new clothes and school supplies. My favourite back-to-school tradition is having a photo taken on the steps on the first day of school. My favourite is back to school clothes shopping. My fave back to school tradition is getting up early to make the family a homemade breakie. My favourite back to school tradition is taking my grandchildren out to buy them new shoes! shopping for back to school clothes and supplies,,I love it! I love buying new notebooks and pens! get a brand new backpack! Taking their pictures in the front before walking to school on the first day. My favorite tradition was going on one last summer vacation right before school started. buying new outfits is always fun. I love putting labels on all of the new school supplies- we always do it as a family and share snacks and stories! I love buying a fresh bouquet of coloured pencils. My favorite back to school tradition is getting new clothes and going out for dinner with my family to celebrate the start of school! I love going shopping for school supplies and getting my desk set up. Taking a picture before leaving the house! My favourite back to school tradition it taking my kids to pick out their first day of school outfit. 1st kid off to kindergarten so we will be making traditions! buying school supplies and sharpening all the colouring pencils, I love that smell. My favourite back to school tradition is having a special day before starting school. We might have a bonfire or go to the movies or something really fun! We have a full day of fun and shopping. Buying new warm, comfy sweaters! My favourite back-to-school tradition is going shopping for new school supplies and clothes. New clothes and school supplies! Carrying on tradition as did my Mom - when my 10 year old son leaves for school - little or not - he still gives Mommy a hug and I get to repeat these words for the millioneth time "I love you son, have a good day". I love buying new clothes! I always loved going back to school for the clothes!! I still always have the urge to go shopping and buy some new fall outfits. Bailey Dexter When I was starting school we would make a day out of shopping and lunch, so with my daughter I do the same! Fave memories include....setting out my weeks worth of outfits! And which backpack I was going to get! Back to school shopping! Although it can be a bit stressful if the kids don't feel like trying on clothes. I buy some things without them and take them out once with me. Back to school shopping! I love buying my boys new clothes and some easy lunch snacks! Getting a back to school photo of all my kids before heading out on the first day of school. back to school shopping and especially when I get a great deal! My favourite BTS tradition is going school supply shopping! Taking photos of our kids on their first day at school! Shopping for new school supplies. Our favorite back to school tradition is shopping for a new back pack! I like putting the new pencils in a fresh new pencil case.